WHERE: desert flats, Hurricane, Utah, USA. WHAT: cholla cactus. MAP: Hurricane. Thumbnail/link clicks  pop-up larger images. Anyone who has crossed needles with a British hawthorn  hedge will probably have suffered more than punctured composure. Indeed, there is an expression describing a person's dishevelled appearance making them look as though they have just been "dragged through a hedge backwards". The experience will leave you in doubt about the ancients' skill in selecting a plant to make a stock proof field boundary: effective against hikers, too! On the desert flats, beyond the edge of the town where we now live, below the eroded stumps of the now dormant volcanos that crenellate the ridge of the exposed fault escarpment, grows a plant with an even worse reputation. 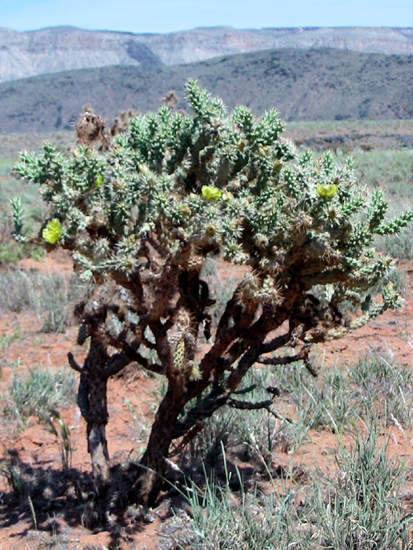 The hawthorn does not go out of its way to injure, but the cholla cactus has a reputation for preemptive strikes: it is said that this cactus will fire its long needles into any creature whose nearness it senses, and the effect is said to be devastating. Our research, and observations, suggest that the cholla has had a bad press: the devastation is real enough, but the alleged proaction seems to be a false accusation.